You probably think of Uhu glue in the schoolroom or office – but Uhu is just as useful when you’re redecorating your home! 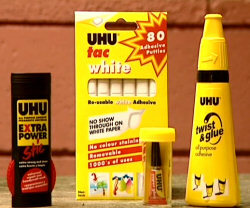 The much-loved Uhu Stic – its bigger, stronger brother: Uhu Power Stic! The Power Stic is the natural development of the original Uhu Stic – a solid bar of glue that you extend as you need it. And only a much as you need – the cap stops it drying out and you can dial it back in when you’re finished. The adhesive in the Power Stic is super strong and completely transparent. It’s perfect for a thousand uses around the home – the universal repairer! High yield and resistant to water, mineral oils, diluted acids and alkaline, the Power Stic will bond hard and soft plastics, leather and leather imitations, shoe soles and other rubbers, foam rubber, plexiglass, carpets, cork, textiles, cardboard and paper. Twist & Glue oval head is rotatable – you can apply it either as dots.... thin lines for accuracy.... or wide swipes to cover a lot of area. Each Super Mini contains only 1 gram – plenty for a single job and then you throw it away. They bond so quickly and so securely, they’re great to fix toys, crockery, mobile phones – anything and everything around your home. Just apply it where it’s needed – hold the break together for a few seconds, then leave it to completely bond. Most walls are white and cream – so Tac White suits them much better. You get 80 adhesive putties in each pack and, since Tac White can be used again and again – it’s very economical. And if you put up posters with Tac White, it won’t leave a stain when you take them down again. But Tac White can do a lot more than just posters. You can use it on wood, plaster, plastic, glass, metal and china… and to fill in small holes in the wall! You’ll find them all at Woolworth’s, Big W, K, Mart, Office works, News X Press, News power and your local News Agency.